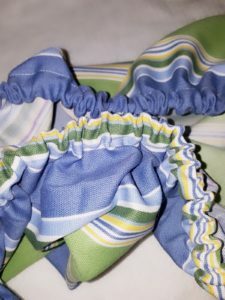 While looking through my stash of fabric one day, I realized that I had several yards of heavy weight striped fabric that will make perfect use for a home decor project. My iron board cover was in need of a complete makeover since it was looking a bit shabby. Yes, I could have replaced the shabby iron board cover with a new boring store bought iron board cover. Why do that when I can have a beautiful custom iron board cover of my own. 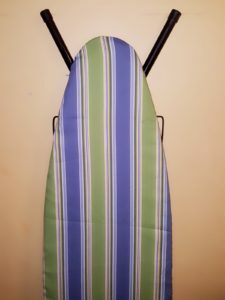 Sewing an iron board cover is a quick easy project that takes no time to create. 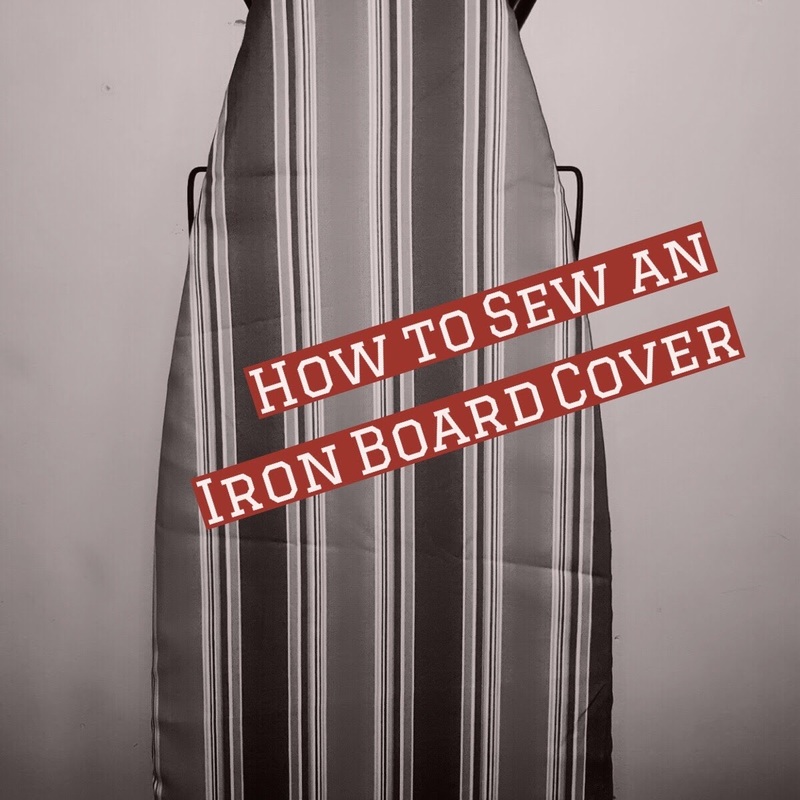 Here is a step-by-step tutorial so you can create you own beautiful iron board cover! Needlelpunched Insulated Lining (heat protecting material between iron board and fabric cover. Remove the old iron board cover and lining. 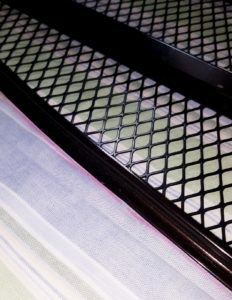 Place our ironing board upside down on top of the fabric. Trace around the perimeter of your iron board with the tailors chalk. 2. Then measure and mark 3” seam allowance around the border (drawing). Cut along the traced line. 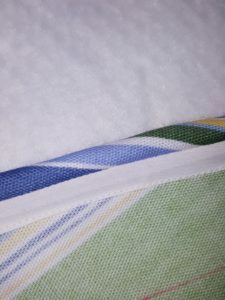 You can reuse the old lining but if wish to replace it with a new one place the iron board on top of the lining and trace it to the exact size of the iron board then cut along the traced line. 3. Open out the bias tape and press one of the short ends under about 1” wrong sides together. 4. 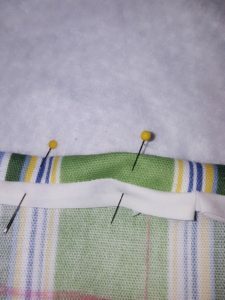 Open up the length of the bias tape, pin to the raw edge of the fabric right sides together. 5. With the short end of the binding still folded begin edgestitching along raw edge of the fabric. 6. 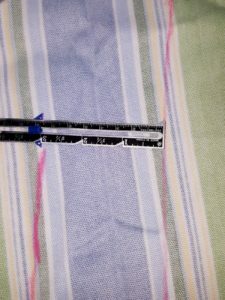 When you are about 1” from where you started stop stitching then cut the binding leaving about 1½”. 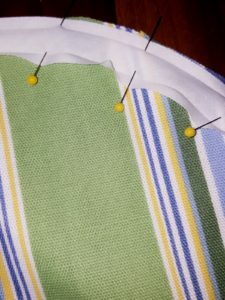 Fold the end under, pin it, finger press, then stitch along the over the folded edge, guiding it under the needle carefully. 7. Finger press ¼” of the binding then pin binding to the wrong side of the fabric. 8. Edgestitch about ⅛ in along binding creating about an 1” casing. 9. You should now have casing for your elastic tape. 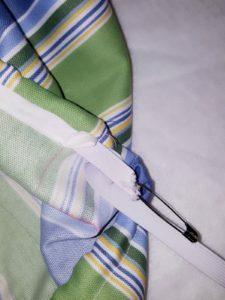 Attach one end of the elastic tape with a safety pin then begin guiding it through one end of the casing until it comes out of the opposite side. Pin both ends together. 10. 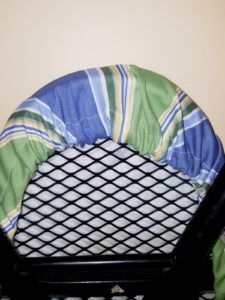 Place the cover of the iron board and adjust elastic band for a secure fit. 11. Remove cover from iron board then triple stitch both ends of the elastic tape together. Now enjoy your new custom iron board cover!